Kaashmora’s trailer released today (7th Oct) along with its magical album. The two minute - ten seconds trailer was almost divided into two halves. The first half teased Karthi’s probably present day avatar. The trailer straight away hints at a sort of a reincarnation subject through the dialogues “Ezhu jenmathin piravi payanam, thavam, villaai antha thee vinayai thulaikum…”. Just before an abrupt pause at 0:52, Karthi gets a scintillating intro as he is seen correcting his collar, with magic!? Everything past 0:52 is colossal in terms of raising the expectations. 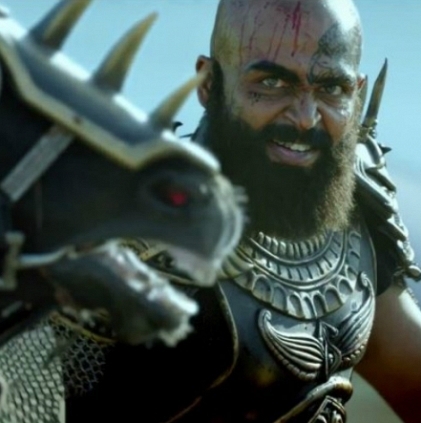 Karthi’s costume and appearance as Kaashmora, Nayanthara’s mystic countenance as Ruthra Mahadevi, Sri Divya’s sensibly studious montage as Yamini, Santhosh Narayanan’s Rock riffs, strong CG - everything unfolds after 0:52 and impresses. Overall, the trailer revealed close to nothing about the plot and story and did an awesome job of keeping us waiting for the film. Gokul seems to have created magic.Thumbs up for the trailer. People looking for online information on Kaashmora will find this news story useful.